Everyone should vist Rome and Venice at least once in their lifetime and we have combined both cities in this fabulous and affordable City Break. Re-live the brutality of Ancient Rome with a visit to the Colosseum and then enjoy the Artistry and Refinement of Venice in these two very different Italian cities. Early booking is recommended at these prices. 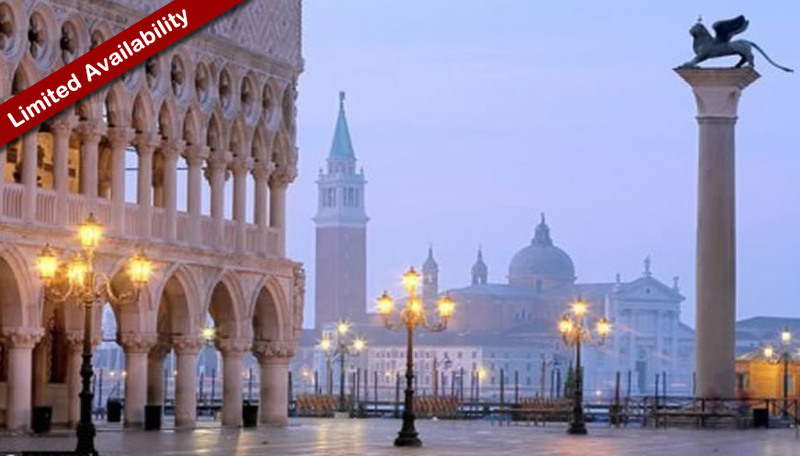 The key landmarks, the Basilica di San Marco and the Palazzo Ducale, are hardly what we normally think of as Italian: fascinatingly idiosyncratic, they are exotic mixes of Byzantine, Romanesque, Gothic, and Renaissance styles. Shimmering sunlight and silvery mist soften every perspective here; it’s easy to understand how the city became renowned in the Renaissance for its artists' use of colour. The city is full of secrets, inexpressibly romantic, and, in both art and everyday life, given over to an unabashed celebration of the material world. You'll see Venetians going about their daily affairs in vaporetti (water buses), aboard the traghetti (gondola ferries) that carry them across the Grand Canal, in the campi (squares), and along the calli (narrow streets).